Tell us about your intellectual interests, how they sprung from your course, service, work or life experiences, and what makes them exciting to you. Describe how ILR is the right school for you to pursue these interests. Ever since I was young, I was curious about inequality. My neighborhood was one of the poorest districts in Tokyo. Growing up in that region, I often saw homeless people along the river bank, in parks and at subway stations. Their despondent countenances lingered in my head, and I wondered why society was so unfair. After I experienced an earthquake in 2011, I became interested in social sciences, especially economics, as professions. My passions for them were confirmed after I came to the US. When I was about to exit the grocery store, an old African American man opened the door for me. I appreciated his kindness at first; however as he opened the door, he asked me for change. There was an awkward silence for a few seconds as I did not know how to react. Yet, over the years I have lived in the US, I have observed that this is not a rare occurrence. Similarly, when I traveled to New York City, I saw a lot of beggars everywhere. I was taken aback by the degree of economic inequality in the US. The ubiquity of homeless in the world’s largest economy, and the fact that the most of the homeless were colored, shocked me. I hypothesized that the country’s economic growth was due to leaving the unprivileged behind. My previous experiences have shaped my ultimate objective: to fight for inequalities by discovering economic policies that would provide an opportunity to minorities to achieve their goals. I believe that effective fiscal policies, such as government’s increase in educational spending, can provide chances to the minorities to gain academic experience to discover their passions. I was also thrilled by the fact that giving chances to overlooked minorities may lead to unimaginable potentials and develop the world overall. Since my passion has been shaped, my role model has been Alan Krueger, a former US assistant secretary of the treasury for economic policy. Gruger, a graduate of Industrial Labor Relation School of Cornell, has made a lot of accomplishments in his researches about economic inequality. His researches include the effects of minimum wage on employment and that of education on wage. Like Kreuger, I hope to find ways to economically empower the minorities by determining minorities’ difficulties at workplaces and pursuing public policies that would alleviate their issues at the IRL School. In high school, I found myself enjoying to study about Economics and Statistics. My strengths can be harnessed in IRL’s curriculum because economics plays a significant role in workplace, and skills in data analytics will hone my decision-making. In addition, professors and faculties who have actually created an impact in society teach at IRL School. Professor Gary Field’s research has helped the poor by working through his influence on World Bank lending program. It was my dream to interact and be taught by such faculty. With a lot of faculties at IRL having global experiences and its students from all over the world, I will surely gain knowledge about labor relations in other countries and develop multiple perspectives. The availability of source to help my dream realize is not limited to academic courses. Outside of the classroom, the student organizations are there to further my perspectives and knowledge. For instance, I would like to join Minority ILR Student Organization to learn the experiences of people of color in the workplace. Hearing directly from the people of color at workplace would be the most accurate and practical way to determine the difficulties of the minorities at employment and job-seeking. Thus, I can immerse myself into discovering the solutions that would not only empower the minorities but also lead to the development of human beings. IRL will undoubtedly establish the foundation for my future dream by allowing me to study and investigate the relationships between minorities and employment. 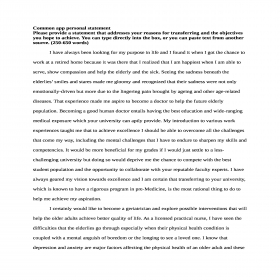 Common app personal statement Please provide a statement that addresses your reasons for transferring and the objectives you hope to achieve. You can type directly into the box, or you can paste text from another source. (250-650 words) I have always been looking for my purpose in life and I found it when I got the chance to work at a retired home because it was there that I realized that I am happiest when I am able to serve, show compassion and help the elderly and the sick. Seeing the sadness beneath the elderlies’ smiles and stares made me gloomy and recognized that their sadness were not only emotionally-driven but more due to the lingering pain brought by ageing and other age-related diseases. That experience made me aspire to become a doctor to help the future elderly population. Becoming a good human doctor entails having the best education and wide-ranging medical exposure which your university can aptly provide. My introduction to various work experiences taught me that to achieve excellence I should be able to overcome all the challenges that come my way, including the mental challenges that I have to endure to sharpen my skills and competencies. It would be more beneficial for my grades if I would just settle to a less-challenging university but doing so would deprive me the chance to compete with the best student population and the opportunity to collaborate with your reputable faculty experts. I have always geared my vision towards excellence and I am certain that transferring to your university, which is known to have a rigorous program in pre-Medicine, is the most rational thing to do to help me achieve my aspiration. I certainly would like to become a geriatrician and explore possible interventions that will help the older adults achieve better quality of life. As a licensed practical nurse, I have seen the difficulties that the elderlies go through especially when their physical health condition is coupled with a mental anguish of boredom or the longing to see a loved one. I know that depression and anxiety are major factors affecting the physical health of an older adult and these not only affect their state of happiness but more on their ability to function. And when these conditions are not treated could lead to other diseases such as myocardial infarctions. I do hope to collaborate with your experts in discovering ways to better manage the older adults’ multiple health problems by coming-up with care plans that will address their specific needs. Caring for the sick and the elderly is a very rewarding experience because it sends the message that they are not neglected nor taken for granted despite their vulnerability. I am positive that your program will certainly help me make a difference in the field of geriatrics and be of service to the individuals who were once productive citizens of the country. Certainly, your program will provide me a solid foundation and critical thinking skills to better understand the complexities that older adults experience. Writing Supplement Tell us what you’d like to major in at Cornell, and why or how your past academic or work experience influenced your decision, and how transferring to Cornell would further your academic interests. (Please limit your response to 650 words.) As a practical licensed nurse, I have been a witness to many lives crippled by diseases causing their inability to care for themselves. Though we have always been promoting independence to the elderlies especially in maintaining their personal hygiene, there are really cases when the person’s illness curtails his ability to function and is left to the mercy of others for his daily necessities. I believe that preventing diseases is still the most important in thwarting crippling diseases and I want to help the future older adults improve their quality of life by promoting precautionary measures in sustaining their physical and social functioning. I am aspiring to become a geriatric someday so I can help in exploring possibilities in restoring the functionality of the older adults and your program in pre- human Medicine will certainly help me achieve my goals. My experiences as a Licensed practical nurse/charge nurse have opened my eyes to the helplessness of the older adults and how age-related diseases greatly affect not only their physical health but also their psychological and mental dispositions. It is also heartbreaking to see cases of depression due to the feeling of being neglected by their loved ones whom they have loved and cared for. Furthermore, the Baby Boomers are getting older by the day so the number of older adults will be increasing rapidly, along with the cases of arthritis, dementia, diabetes and heart diseases as studies show that these are the medical problems that older adults usually experience. Reflecting from these, I could visualize the difficulties that the aged people will go through and how pitiful their conditions would be if their symptoms will not be addressed. Seeing first-hand how they suffer made me more resolved to become a geriatric, and certainly, your program in pre-Medicine would be the most valuable first step in my journey to the field of Gerontology. The flexibility in the curricula offered by Cornell University increases my interest to transfer and pursue a career in human medicine because it does not only allow students to complete the major course but also provides the opportunity to take the pre-Medicine course at the same time. This is like ‘shooting two birds at the same time’, which implies the maximization of my productivity at the least possible time. Since I have been an advocate of personal growth through experiences, I can take advantage of the expertise of Cornell’s well-known faculty by working with them and possibly, collaborating with them in doing researches beneficial to the field of gerontology. I am positive that your program in pre-human Medicine is in line with my educational and career objectives and will prepare me to becoming a geriatric someday. I am certain that Cornell University is the best partner in my quest to realizing my purpose in life, and that is, to help the older adults in their twilights. 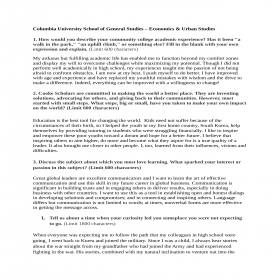 Columbia University School of General Studies – Economics & Urban Studies 1. How would you describe your community college academic experience? Has it been "a walk in the park," "an uphill climb," or something else? Fill in the blank with your own expression and explain. (Limit 600 characters) My arduous but fulfilling academic life has enabled me to function beyond my comfort zones and display my will to overcome challenges while maximizing my potential. Though I did not perform well academically in high school, my experiences taught me the passion of not being afraid to confront obstacles. I am now at my best. I push myself to do better. I have improved with age and experience and have replaced my youthful mistakes with wisdom and the drive to make a difference. Indeed, everything can be improved with a willingness to change! 2. Cooke Scholars are committed to making the world a better place. They are inventing solutions, advocating for others, and giving back to their communities. However, most started with small steps. What steps, big or small, have you taken to make your own impact on the world? (Limit 600 characters) Education is the best tool for changing the world. Kids need not suffer because of the circumstances of their birth, so I helped the youth in my first home country, South Korea, help themselves by providing tutoring to students who were struggling financially. I like to inspire and empower these poor youths toward a dream and hope for a better future. I believe that inspiring others to aim higher, do more and become what they aspire for is a true quality of a leader. It also brought me closer to other people. I, too, learned from their influences, visions and difficulties. 3. Discuss the subject about which you most love learning. What sparked your interest or passion in this subject? (Limit 600 characters) Great global leaders are excellent communicators and I want to learn the art of effective communication and use this skill in my future career in global business. Communication is significant in building trusts and in engaging others to deliver results, especially in doing business with other countries. I want to use this as a tool in establishing open and honest dialogs in developing solutions and compromises; and in connecting and inspiring others. Language differs but communication is not limited to words; at times, nonverbal forms are more effective in getting the message across. Tell us about a time when your curiosity led you someplace you were not expecting to go. (Limit 1800 characters) When everyone was expecting me to follow the path that my colleagues in high school were going, I went back to Korea and joined the military. Since I was a child, I always hear stories about the war straight from my grandfather who had joined the Army and had experienced fighting in the war. His stories, combined with my natural inclination to venture out into the unknown, led me to follow his path and experience first-hand what he had been through. I found the training really tough but grateful because that taught me how to be calm amid threats of death and be systematic while dealing with explosive bombs. As an Explosive Ordinance Disposal Technician in the Rangers Company, I learned to eat my fright and be focused on what I do because a single mistake could cost my life. I also had to undergo stringent trainings on survival skills which include carrying a 50-kilo bag under below 20°C weather. However, I also learned time management, discipline, perseverance, leadership and teamwork. I did well as a squad leader and gained knowledge on how to combine two troops together effectively. Overall, the military training has brought out the best in me and made me well-adept and prepared in dealing with different aspects of life. It was also during that time that I came to know my real self – my capabilities, capacities, weaknesses, strengths and endurance. My curiosity made me a well-disciplined leader who knows how to deal with people, follow and give orders and excel under pressure. The answers to my curiosity brought me to a different dimension of helping others and became selfless. Seeing the difficulties of the children in the community in getting better education has changed me from being carefree to caring; from being a receiver of instructions into a strategist. Columbia University – MSW (Social Work) Question 1 Discuss why you want to be a social worker. What personal, academic, volunteer and/or work experiences have influenced this choice? If you have worked in other fields, please discuss the reasons for this change. As a child of Japanese and Korean parents, I experienced first-hand how family tensions and violence can spring from a long history of national and cultural conflicts. In a sense, I had to skip my adolescence because I was placed in the position of acting as a mediator in the constant conflicts between my parents and sometimes my grandparents. My Japanese grandparents held certain prejudices about Koreans and tried to keep my brother and me from assimilating Korean culture. In my family, I felt as if I had to act as a bridge between two cultures and I took on the responsibility of shielding my little brother from my grand-parents’ attempts to cast aspersions on the Korean-ness of my mother. I felt strongly that my brother should have a chance to develop a progressive, fair, and unprejudiced perspective on questions of culture and nationality. Through this experience, I developed a strong impulse to fight prejudice and help marginalized people and cultures to be heard and valued as individuals and as a group. My work experiences in mental health services in Korea, as well as my extensive research experiences at the University of Chicago, have developed my curiosity about the effects of culture on human development and mental health practices, both at individual and social levels. Specifically, I am interested in (1) how mental illness and behavioral outcomes develop through a longitudinal study; and (2) how cognitive behavioral therapy and prevention programs can be modified for different cultures for better results. My research experience in Professor Keysar’s cognitive psychology lab showed me how one aspect of culture—language—can affect the cognitive processes of individuals at an individual level. As a research assistant, I was able to examine how language and accents affect the judgment and decision-making of individuals. For example, I worked on a project that studied the extent to which subjects perceive foreign accents to be less credible than native accents. My contribution in this lab included running studies, acting as a confederate, translating documents, and contacting organizations and businesses for the potential recruitment of bilingual subjects. I also surveyed the relevant literature for possible companion studies that look at the relationship between language and construal levels. This research experience taught me the skills necessary to conduct a study—from the planning process to the execution—and to gain a better understanding of how language, an important aspect of culture, is quantitatively studied in the social science field. 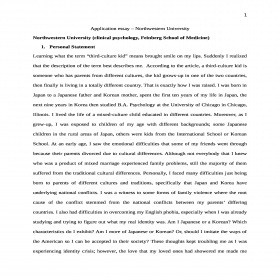 Similarly, my research involvement in Professor Choi’s five-year longitudinal project, the Midwest Longitudinal Study of Asian American Families, has given me the opportunity to study how cultural differences in family processes, such as parenting style, affect childhood development. This study, which is funded by the National Institutes of Child Health and Human Development, examines the family processes of Asian American families living in the United States and the developmental outcomes of their children. Though this study is still at the pretesting stage, the experience of working on this project has given me valuable insight into measurement compiling, cognitive interviewing, data collection training, data import and export using SPSS, and recruitment outreach. As part of this project, I was assigned exclusive responsibility for learning The Survey System software, coding questionnaires, and publishing user-friendly online surveys, which included over a hundred questions. In this role, I served as the primary mediator between my research manager and the software technicians, negotiating the requirements of the study and the technical possibilities of the software. As part of my recruitment outreach for this project, which put me in regular contact with Filipino communities, I gained valuable social skills in collaborating with potential subjects in a manner that is both culturally sensitive and professional. Overall, my experience on this project has given me the research skills and knowledge necessary to study the effects of culture on development, both qualitatively and quantitatively. Aside from these valuable research experiences, I have also had the opportunity of studying how culture and society affect the field of mental health at a social level, namely with regard to versatility in mental health practitioners. While translating and organizing data for Professor Orlinsky’s international research project, which examines data from mental health practitioners across countries, I learned how practitioners differ throughout the world and got a sense of how this influences their clients, their stress levels, and the clinical approaches used. Depending on the country, mental health providers range from clinical and counseling psychologists to social workers to priests. My own clinical experience in Korea is a great example of this variety; unlike mental health practitioners in the United States who hold at least a master’s degree, practitioners in Korea do not need such a high educational level as long as they complete therapist training sessions. This explains the variety of professional backgrounds of the trainees at the Psychomotorik therapist training program, such as kindergarten teachers and human resources educators. In fact, as a first-year undergraduate student at the University of Chicago, taking a short leave of absence, I was able to get a license as a Psychomotorik therapist upon completing a 200-hour program at the Korea Institute of Psychomotorik and Motology in Korea. In addition, I was qualified to assist counselors at a children’s mental health care center where I worked with clients of varied backgrounds and helped design therapeutic activities for ADHD students at a local elementary school. My experience with the variety of qualifications and standards for mental health practitioners across cultures stoked my curiosity about the consequent variety in treatment approaches and clinical outcomes. 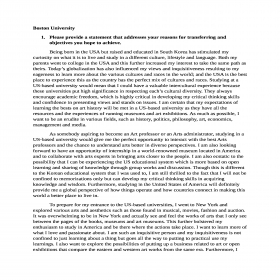 With my academic, research, and life experiences, I am confident that an advanced study will make it possible for me to make real and useful contributions to our understanding of less-studied psychological phenomena, and to the promotion of healthier communities, particularly for minority and marginalized populations in the U.S. Question 2 What attributes do you possess that contribute to your abilities to be helpful to others? Tell us about a specific example or a critical situation in which you have played a helping role. What attributes might you change to strengthen your ability to be helpful to others? My childhood in Japan, my middle and high school years in Korea, and college years in the United States have instilled in me a deep appreciation of the value of cross-cultural experiences. I was born in Japan to a Japanese father and Korean mother and spent the first ten years of my life in Japan attending a local school in a rural area. From the time I was 10 until I was 19, I lived in Korea where I attended an international school and graduated with five International Baccalaureate Higher Level diplomas. I attended the University of Chicago as an undergraduate and also spent time during my college years working and doing research. My role as a family cultural “bridge” intensified with time. Because my grandmother refused to contact my parents directly, I became the intermediary between my grandmother in Japan and my parents in Korea. It would perhaps have been easier for me to ignore my grandmother, as I could not see any justification for her to reject my mother because of her ethnicity and socioeconomic background. Instead, I felt a duty to advocate constantly on behalf of my mother, and I pushed my grandmother to “unlock her door.” Years later, she did finally open up to my mother and our whole family. Though I learned a lot from this experience, it was a hard way to live as an adolescent and I often found myself putting my own needs on hold while prioritizing that of my family’s. The difficulties that I experienced in my childhood and adolescence have given me a better understanding of other peoples’ predicaments and have enabled me to develop a deep curiosity about, and a keen eye with which to observe and make sense of other people’s unique backgrounds, particularly the experiences of children of bi-cultural marriages. Although not everybody that I knew who was a product of mixed marriage experienced family problems, the majority of them seem to experience some tensions in their family life as a result of their parents’ differing traditions and cultural norms. I began thinking about why some children who grew up in conflict-ridden bicultural families went on to live happy lives while others remain trapped by the after-effects of trauma. What can explain the different outcomes? 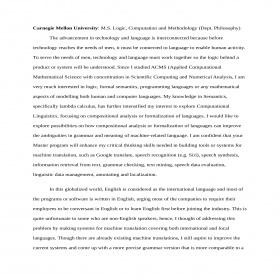 Carnegie Mellon University: M.S. Logic, Computation and Methodology (Dept. Philosophy) The advancement in technology and language is interconnected because before technology reaches the needs of men, it must be connected to language to enable human activity. To serve the needs of men, technology and language must work together so the logic behind a product or system will be understood. Since I studied ACMS (Applied Computational Mathematical Science with concentration in Scientific Computing and Numerical Analysis, I am very much interested in logic, formal semantics, programming languages or any mathematical aspects of modelling both human and computer languages. My knowledge in Semantics, specifically lambda calculus, has further intensified my interest to explore Computational Linguistics, focusing on compositional analysis or formalization of languages. I would like to explore possibilities on how compositional analysis or formalization of languages can improve the ambiguities in grammar and meaning of machine-related language. I am confident that your Master program will enhance my critical thinking skills needed in building tools or systems for machine translation, such as Google translate, speech recognition (e.g. Siri), speech synthesis, information retrieval from text, grammar checking, text mining, speech data evaluation, linguistic data management, annotating and localization. In this globalized world, English is considered as the international language and most of the programs or software is written in English, urging most of the companies to require their employees to be conversant in English or to learn English first before joining the industry. This is quite unfortunate to some who are non-English speakers, hence, I thought of addressing this problem by making systems for machine translation covering both international and local languages. Though there are already existing machine translations, I still aspire to improve the current systems and come up with a more precise grammar version that is more comparable to a local human translation. I remember what Dave Barry (author) said about Bill Gates and I quote: “Bill Gates is a very rich man today… and do you want to know why? The answer is one word: versions”. Coming-up with a more precise version of machine translations will definitely help the non-English speakers understand the software and programs available in the market. Furthermore, the program will not only benefit the IT people but also everybody who uses the internet in selling, manufacturing and communicating purposes. I am aspiring to make a connection between the need (problem) and its possible solution; after all, statistics show that there are more people who are non-English speakers. In addition to machine translation, I also would like to make my own version of the popular speech recognition app to include detection of specific accents of consumers from the non-English speaking areas. Different races have different accents of speaking words so this will be taken into consideration, including the pitfalls experienced by current speech recognition apps such as limited substitution of words in one language for words in another language without recognizing phrases or their closest equivalent in the specified language. To prepare for your program, I took a class and a seminar in Semantics from graduate level classes. I am positive that your Master’s program in Logic, Computation and Methodology are in line with my educational and career objectives and will bring out the best in me in maximizing my potentials. I will be looking forward to work with your faculty and experts in making significant applications that will serve the multitude. I have very high hopes for my future and I am certain that your university is the best partner in achieving my aspirations. 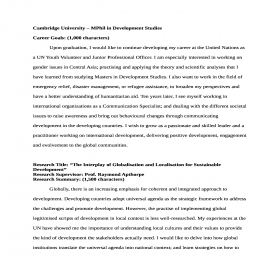 Cambridge University – MPhil in Development Studies Career Goals: (1,000 characters) Upon graduation, I would like to continue developing my career at the United Nations as a UN Youth Volunteer and Junior Professional Officer. I am especially interested in working on gender issues in Central Asia; practising and applying the theory and scientific analyses that I have learned from studying Masters in Development Studies. I also want to work in the field of emergency relief, disaster management, or refugee assistance, to broaden my perspectives and have a better understanding of humanitarian aid. Ten years later, I see myself working in international organizations as a Communication Specialist; and dealing with the different societal issues to raise awareness and bring out behavioural changes through communicating development in the developing countries. I wish to grow as a passionate and skilled leader and a practitioner working on international development, delivering positive development, engagement and evolvement to the global communities. Research Title: “The Interplay of Globalisation and Localisation for Sustainable Development” Research Supervisor: Prof. Raymond Apthorpe Research Summary: (1,500 characters) Globally, there is an increasing emphasis for coherent and integrated approach to development. Developing countries adopt universal agenda as the strategic framework to address the challenges and promote development. However, the practise of implementing global legitimised scripts of development in local context is less well-researched. My experiences at the UN have showed me the importance of understanding local cultures and their values to provide the kind of development the stakeholders actually need. I would like to delve into how global institutions translate the universal agenda into national context; and learn strategies on how to integrate it into local plans. The research will discuss “good and bad” examples of development projects to show how the interplay of globalisation and localisation of development can bring more sustainable results. Different aspects of development including human rights, rule of law, education and gender will be explored to describe different methodologies of “glocalisation” of development. Group learning and cultural awareness in empowering others will also be searched to ensure equal opportunities. Development involves change and many people are against it because of familiarisation. Hence, this research will help in understanding the “local” in the “global” environment, which the approach to development reduces the barrier for the stakeholders in absorbing new ideas and helps to achieve continual reform even post-intervention programs. Statement of Interest (2,500 characters) What I thought was a success turned out to be a stalemate; then I realized, development is only achieved if all the stakeholders are committed and driven to reach the common goal. Responding to a research showing the strong need for safety of schools in Kyrgyzstan, I initiated a project with UNICEF named Safe School project. It was implemented in 3 cities where over 11,000 school children were educated on safety measures. But whilst everybody thought we had a success, a mother from a rural village told me that though they were grateful for the work done, most people in her town still believed that natural disasters are God’s will and a punishment for sinning so man should embrace the fate with humility. I was astounded; then I realized my project was based on the assumption that the community needed help so I had to inject development for the best interest of the children. However, I forgot to include the religious leaders as part of our target audience. I overlooked the fact that I was in a different country with a different culture, ethnicity and tradition. I forgot the fact that the whole community would be the driving force of the project and without their commitment and cooperation, no amount of investment would bring lasting improvement. And that reflection led me to pursuing MPhil in Development Studies, a program that will allow me to build an approach to development grounded on thoughtfulness and reflection of historical, racial and political matters. 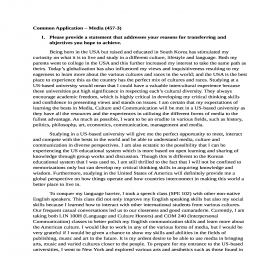 BOSTON UNIVERSITY – International Relations Question 1: Please provide a statement that addresses your reasons for transferring and the objectives you hope to achieve. You can type directly into the box, or you can paste text from another source. 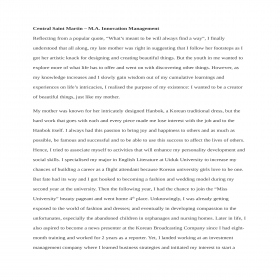 (650-word maximum) My desires to always excel and maximize my full potentials have motivated me to look for the best university that will bring out the best of me. And transferring to your university has become my prime objective as I know that Boston University provides the best opportunities to interact and connect their students to global communities. In today’s world, having the right connections could lead to positive outcomes such as collaborations, global internships and professional affiliations that I could benefit from even post-graduation. By staying always involved in the things that interests me will surely help me in keeping abreast with the changes of time and in adapting to various innovations. I am sure that being able to engage with the current global pressing issues will broaden my perspectives and improve my critical thinking skills valuable to my aspiration of getting a portal for a global career. In addition, living and studying in Boston will provide me the chance to live with people from various backgrounds and cultures; and experience first-hand how policy makers run a progressive city such as Boston. While growing up, I have learned the relativity of global exposure and business and the importance of harmonious relationships in achieving success. This was further highlighted when I moved to the US and experienced how learning to co-exist pleasantly with people from different cultures and backgrounds could be a catalyst for progress. Learning other culture is synonymous to gaining new knowledge because each has its own worldview, traditions and history. The exchange of culture could provide me a better understanding on how the world functions and how humans are shaped by their own resources, landscapes, experiences and challenges. As a person aspiring to have a global career, understanding the preferences of other races will make me well-informed when making decisions. One of my professors in college told me to “go beyond what you have been told”. That was when I realized that I should not be contented with just being angry about what I hear from the news but be more active in letting other people hear my stand. And the best apt to do this is to study International Relations so I would know how to tackle inequality, poverty, fake news and information and many other things that plague the world. I am highly interested in the Global Program Support that your university provides and I am positive that if given a chance, I would be able to make my own research on global inequality in governance. Having an international back-up when doing research is what most students look for and I am very thankful that Boston University has its own website that students can log-on to whenever we need assistance. Just hearing the bad news everyday provokes my anger but I know that my reactions would be better heard if I am armed with the knowledge on International Relations. I am certain that your program in International Relations will provide me the opportunity to learn leadership skills as well as hands-on learning skills through collaborations with your competent faculty. I am positive that as International Relations major, I will gain the core knowledge of the international system and improve my analytical skills to better understand the impact of globalization on business, society and government. Furthermore, I love challenges; and I am sure that my intellect will be honed to the fullest if I compete with the bests academically. I am confident that your program will unleash my potentials in finding ways to promote equality among men and ensure that everyone gets an equal access to services and opportunities. With your guidance, I will surely make a difference in making this world a better place. Question 2: What about being a student at Boston University most excites you? (250-word maximum) Dean Adil Najam once said, “The magic of higher education happens when you match great faculty with great students”, hence, I am so excited to meet your esteemed and experienced faculty and learn from their varied international career experiences. It also excites me to study in a university that brings together people from a variety of disciplines and backgrounds and learn from each other’s cultures and traditions. A university with diverse student population is strong because it prepares its students to the real world. Being in that environment will make me feel like engaging as a truly global citizen. I also like to participate in the Undergraduate Research Opportunities Program where I could learn, as well as develop new knowledge, and gain valuable hands-on experiences. I want to join some of the student clubs to hone my hidden talents. In particular, I would love to join speech and debate clubs so I can articulate my views while improving my vocabulary and speaking skills. I want to try the fitness center and take advantage of having a place where I can swim, exercise or climb a rock wall. All work and no play could make a person dull so the fitness center would serve as a ‘playing hub’ that could condition my mind and relax my body. I will also try the Boston University Community Service Center and check-out its numerous volunteer programs. I have always loved volunteering and I would want to continue doing humanitarian works even in Boston. Boston College 1. Human beings have a creative side that tends to shine most when we are truly invested in the world around us. Describe a situation when you responded effectively to a particular need and found yourself at your creative best. I have always been passionate with what I do and this manifests even in my tutorial activities which I do for free for the benefit of the underprivileged children. Instead of just teaching them the basics or what their assignments require, I also provide them additional information that will help them more understand the theory and allow them to have a critical analysis of what they are studying. This also led to my better appreciation of Mathematics and teaching because I learned to interact with people more, which eventually resulted to gaining more friends and acquaintances. One thing led to another, and I just found out one day that more people were appreciating what I was doing and they were already recognizing my teaching and math skills. This motivated me to think of better ways to help others so I approached my friends who were just letting time pass idly to join me in my volunteer activities so they can use their free time more productively. They did, and I was able to create a group of volunteer tutors for the poor children. This initiative was a success because people recognized our good deeds and our good skills in teaching Mathematics. Eventually, this charitable act became our additional source of income as some hired us to be their private tutors. This turn of events came as a positive change because it has also helped me when I experienced financial difficulties and had to earn money for my studies and upkeep. The charitable act that I did became my means of survival and also opened my eyes to the viability of doing business. Furthermore, the experience also taught me how to spend money wisely, how to detect opportunities and how to remain optimistic amidst challenges. Being passionate on what I do and always thinking out-of-the-box to help people and maximize their potentials has opened opportunities for me, as well as to my friends, who were just there sitting comfortably and just waiting to be approached for the fulfillment of a common goal. It also made me realize that anybody could be a leader as long as he has a heart to help others. It was also heartwarming to know that others were appreciating your actions and you have been an instrument for others to act and inspired them to dream bigger and achieve greater goals. Architecture Admission Paper Response to number 1: When I was kid, I was always fascinated just by looking at the different designs of buildings featured in magazines and books, wondering how they were built and why they were designed as such. Little did I know that I was already interested in Arts and Architecture at such an early age. I only realized it when I attended 102 classes last summer. The classes opened my eyes to the wonderful world of art and the importance of creativity. The teaching style was very encouraging, boosting my inner self to view things in a different perspective and generate new alternatives. The classes have given my mind the freedom to wander and search for possible answers to given problems. It has tapped my originality and my inherent quality of maximizing the potentials of what exists in order to create a new thing. Moreover, the 102 classes have given me the autonomy to decide on what to create and how to do it. It has also made me realized that creativity does not only rely on one’s intellect but could be developed through inspirations from others’ works and ideas. That is how I made my assignments. I did not rely on what I only know but I also researched and observed the works of other students to come-up with an idea which I could say, my own version. 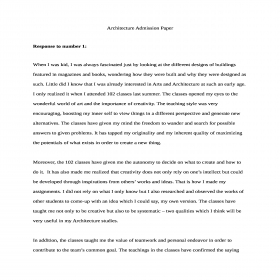 The classes have taught me not only to be creative but also to be systematic – two qualities which I think will be very useful in my Architecture studies. In addition, the classes taught me the value of teamwork and personal endeavor in order to contribute to the team’s common goal. The teachings in the classes have confirmed the saying that ‘two heads are better than one’. Undeniably, I learned by watching how my classmates work and through the class discussions and analysis in problem solving. Through this that camaraderie between us developed and I learned to work with my classmates effectively. This learning is also essential in the study of Architecture because it will require collaboration and cooperation from other fields of study in order to come-up with successful structural designs. Moreover, the classes have taught me the importance of humility and respect for others’ opinions. It is inevitable that opposing opinions will be experienced during the course of work but what is important is the ability of the designer to handle criticisms and welcome the opinions of others for possible positive outcomes. My research also opened my mind to various possibilities such as the different ways of implementing ideas, maximization of resources and the economic way of designing without sacrificing functions and compromising quality. The experience also exposed me to the possibility of creating from scratch. The assignments I did in the class were instrumental to the realization of my dream to put into life the designs that I have been toying in my imagination. The training tickled my imagination to create a new thing out of other things. However, this process has taught me how to implement it step by step – from imagination to sketching and to the actual creation. What was visualized only in my imagination was brought to life and became a new structured creation. 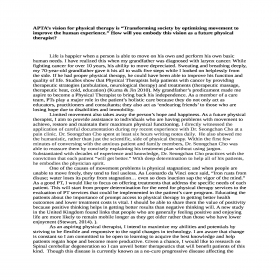 APTA’s vision for physical therapy is “Transforming society by optimizing movement to improve the human experience.” How will you embody this vision as a future physical therapist? Life is happier when a person is able to move on his own and perform his own basic human needs. I have realized this when my grandfather was diagnosed with larynx cancer. While fighting cancer for over 10 years, his ability to move depreciated. Sweating and breathing deeply, my 70-year-old grandfather gave it his all to walk five steps while I looked on helplessly from the side. If he had proper physical therapy, he could have been able to improve his function and quality of life. Studies show that Physical Therapists help patients with cancer by providing therapeutic strategies (ambulation, neurological therapy) and treatments (therapeutic massage, therapeutic heat, cold, education) (Kuma & Jin 2010). My grandfather’s predicament made me aspire to become a Physical Therapist to bring back his independence. As a member of a care team, PTs play a major role in the patient’s holistic care because they do not only act as educators, practitioners and consultants; they also act as ‘endearing friends’ to those who are losing hope due to disabilities and immobility. Limited movement also takes away the person’s hope and happiness. As a future physical therapist, I aim to provide assistance to individuals who are having problems with movement to achieve, restore and maintain their maximum physical functioning. I directly witnessed the application of careful documentation during my recent experience with Dr. Seongchan Cho at a pain clinic. Dr. Seongchan Cho spent at least six hours writing notes daily. He also showed me the humanistic, rather than just the scientific, side of physical therapy. Within the first few minutes of conversing with the anxious patient and family members, Dr. Seongchan Cho was able to reassure them by concisely explaining his treatment plan without using jargon. Substantiated with decades of experience and knowledge, Dr. Seongchan Cho practices with the conviction that each patient “will get better.” With deep determination to help all of his patients, he embodies the physician spirit. One of the causes of movement problems is physical stagnation; and when people are unable to move freely, they tend to feel useless. As Leonardo da Vinci once said, “Iron rusts from disuse; water loses its purity from stagnation… even so does inaction sap the vigor of the mind.” As a good PT, I would like to focus on offering treatments that address the specific needs of each patient. This will start from proper determination for the need for physical therapy services to the evaluation of PT services that could be implemented in the patient’s care program. Educating the patients about the importance of prompt access to physical therapy in getting better health outcomes and lower treatment costs is vital. I should be able to share them the value of positivity because positive thinking helps in getting better results than negative thinking will. A new study in the United Kingdom found links that people who are generally feeling positive and enjoying life are more likely to remain mobile longer as they get older rather than those who have lower enjoyment (Stewart, 2014). ). As an aspiring physical therapist, I intend to maximize my abilities and potentials by striving to be flexible and responsive to the rapid changes in technology. I am aware that change is constant so I am committed to be open to learning to acquire the best knowledge and help patients regain hope and become more productive. 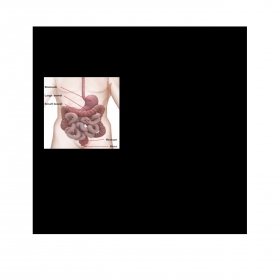 Given a chance, I would like to research on Spinal cerebellar degeneration so I can unveil better therapeutics that will benefit patients of this kind. Though this disease is currently known as a no-cure progressive disease affecting the cerebellum, spine, muscles and the nervous system, I am still hopeful that I can discover new therapies through research. My research on Holoprosencephaly taught me the significance of taking a deep approach to experimentations rather than just being ‘boxed’ on the information needed for assessments. Spinal cerebellar degeneration is such a distressing disease that needs compassion from relatives and friends. I want to collaborate with clinicians and find therapeutics to empower these patients and improve their physical function. What happened to my grandfather were both an eye-opener and an opportunity to explore positive options in Physical Therapy. Given the chance, I am positive that I can discover new treatments because it is in being gritty and optimistic that new knowledge is unraveled. . 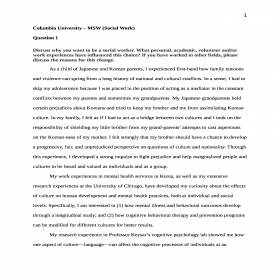 Application essay – Northwestern University Northwestern University (clinical psychology, Feinberg School of Medicine) Personal Statement Learning what the term “third-culture kid” means brought smile on my lips. Suddenly I realized that the description of the term best describes me. According to the article, a third-culture kid is someone who has parents from different cultures, the kid grows-up in one of the two countries, then finally is living in a totally different country. That is exactly how I was raised. I was born in Japan to a Japanese father and Korean mother, spent the first ten years of my life in Japan, the next nine years in Korea then studied B.A. Psychology at the University of Chicago in Chicago, Illinois. I lived the life of a mixed-culture child educated in different countries. Moreover, as I grew-up, I was exposed to children of my age with different backgrounds; some Japanese children in the rural areas of Japan, others were kids from the International School or Korean School. At an early age, I saw the emotional difficulties that some of my friends went through because their parents divorced due to cultural differences. Although not everybody that I knew who was a product of mixed marriage experienced family problems, still the majority of them suffered from the traditional cultural differences. Personally, I faced many difficulties just being born to parents of different cultures and traditions, specifically that Japan and Korea have underlying national conflicts. I was a witness to some forms of family violence where the root cause of the conflict stemmed from the national conflicts between my parents’ differing countries. I also had difficulties in overcoming my English phobia, especially when I was already studying and trying to figure out what my real identity was. Am I Japanese or a Korean? Which characteristics do I exhibit? Am I more of Japanese or Korean? Or, should I imitate the ways of the American so I can be accepted in their society? These thoughts kept troubling me as I was experiencing identity crisis; however, the love that my loved ones had showered me made me stronger and grew up with no hatred in my heart. 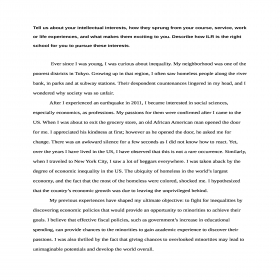 As a matter of fact, the difficulties that I went through gave me a better understanding of other people’s predicaments and have enabled me to develop a keen eye towards other people’s unique backgrounds. This development led to curiosity, thinking out loud why children like me who grew up in a difficult and trying familial backgrounds have emerged to live happily against all odds yet there are others who remained drawn to their depressions and pessimisms. Why can’t they heal their wounds just like I did? Was it something about the clinical counseling? Was it because of their family relationships? Or was it because of the international education that I had? It is a common knowledge that not everyone has the capacity to get an international education due to its associated high costs. Often, the economic conditions of the families of children born out of inter-marriages dictate whether they can afford international education or not. And based on what I have observed during my growing years, the child’s having an international education determines whether his ‘bicultural’ and ‘biracial’ aspect becomes an advantage or a weakness. This is one of the reasons why I took B. A. Psychology in college. I wanted to unearth the logic behind the effect of mixed-culture environment to a child’s development. I wanted to discover why some children are able to use their ‘bicultural’ and ‘biracial’ aspect in ascending to success and why some are deeply affected by the difficulties that go with inter-marriages and become a failure. I wanted to have a deeper understanding on how family structures affect the lives of their children, either positively or negatively. Deep within me I wanted to help confused mixed-culture children develop their confidence and utilize their ‘bicultural’ and ‘biracial’ characteristics to work to their advantage. I wanted to lessen their fear from language difficulties and develop their own culture. I know that psychotherapy could be one of the answers and I can be able to create effective prevention programs if I become a Clinical Psychologist. During my first year at Chicago University, my fear for the English language took toll on me resulting to my absences in classes. I totally struggled during class discussions causing the need for the counselor’s advice and counseling service. But to my dismay, instead of feeling relieved of my anxiety, I found the counselor’s advice to be inappropriate. During the counseling sessions, I felt that the counselor had no complete understanding of the feelings, thoughts and circumstances of students who came to the US for overseas study. I found her to be unmindful of the fact that along with our overseas study was the sacrifice that both the student and his entire family would have to endure for the fulfillment of big dreams. I felt that the prevention or cognitive-behavioral therapies that they were implementing were more applicable on Americans and less effective when applied to minority groups. I have said this because the values, beliefs, and activities incorporated in the therapy were not in congruence to the overseas student’s cultures. Regardless of how good the counseling may be, failing to observe the student from their perspectives, culture and society tend to be less effective and perhaps could bring more frustrations on the part of the overseas child and cause refusal to revisit the counseling office. Accordingly, it is not unlikely to have a therapy that is effective on one type of child and yet ineffective on another child even if the two children suffer the same predicaments. My aspiration to take Clinical Psychology program at Northwestern University Feinberg School of Medicine is partly due to my interest to work with one of its faculty members, specifically, Professor Mark Reinecke, whose specialization in Cognitive-Behavioral Therapy, Anxiety Disorders and Child and Adolescent Psychiatry, to name a few, will be very helpful in my further study. I have read some of his recent publications and I am very confident that his mentorship will bring me to success. 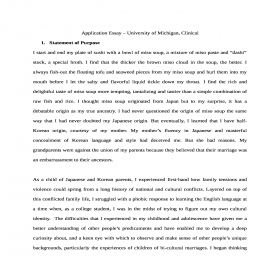 Application Essay – University of Michigan, Clinical Statement of Purpose I start and end my plate of sushi with a bowl of miso soup, a mixture of miso paste and “dashi” stock, a special broth. I find that the thicker the brown miso cloud in the soup, the better. I always fish-out the floating tofu and seaweed pieces from my miso soup and hurl them into my mouth before I let the salty and flavorful liquid tickle down my throat. I find the rich and delightful taste of miso soup more tempting, tantalizing and tastier than a simple combination of raw fish and rice. I thought miso soup originated from Japan but to my surprise, it has a debatable origin as my true ancestry. I had never questioned the origin of miso soup the same way that I had never doubted my Japanese origin. But eventually, I learned that I have half-Korean origin, courtesy of my mother. My mother’s fluency in Japanese and masterful concealment of Korean language and style had deceived me. But she had reasons. My grandparents were against the union of my parents because they believed that their marriage was an embarrassment to their ancestors. As a child of Japanese and Korean parents, I experienced first-hand how family tensions and violence could spring from a long history of national and cultural conflicts. Layered on top of this conflicted family life, I struggled with a phobic response to learning the English language at a time when, as a college student, I was in the midst of trying to figure out my own cultural identity. The difficulties that I experienced in my childhood and adolescence have given me a better understanding of other people’s predicaments and have enabled me to develop a deep curiosity about, and a keen eye with which to observe and make sense of other people’s unique backgrounds, particularly the experiences of children of bi-cultural marriages. I began thinking about why some children who grew up in conflict-ridden bicultural families went on to live happy lives while others remain trapped by the after-effects of trauma. What can explain the different outcomes? Specific features or dynamics of the family relationships? Experiences outside the family? Later, my mother succumbed to depression and panic disorder and she had undergone several interventions but to no avail. Eventually, we found one psychiatrist who uses psychotherapy, especially cognitive behavioral therapy. This seemed to be working on her but she had to quit it due to the difficulty of reaching the psychiatrist’s clinic. However, this experience has opened my eyes to the importance of a scientific model of psychotherapy that balances medicine with therapeutic activity. I also learned that logistical factors can play a surprisingly important and even a decisive role in a client’s ability to find, attend, and sustain treatment sessions. I began thinking about the possibilities of Internet and telephone-facilitated psychotherapy, and the importance of developing innovative approaches to the objective problems that interfere with client retention. But I could only do this if I will be given the chance to pursue Clinical Psychology at the University of Michigan.